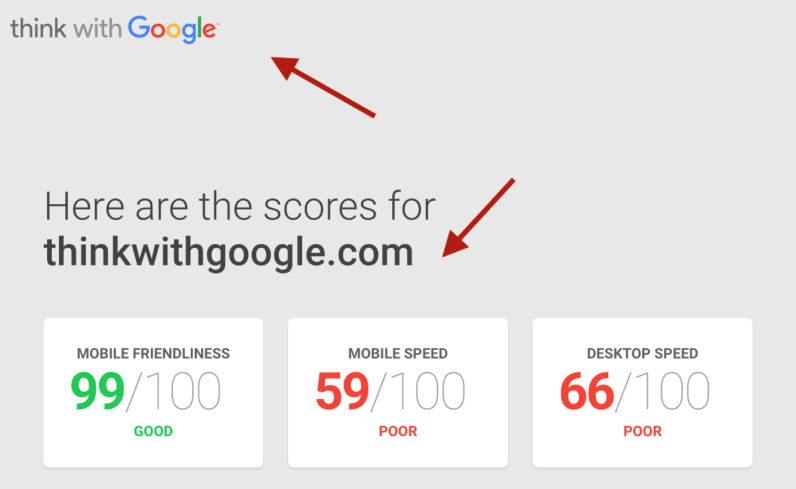 Google today launched a new website testing tool to help you determine its speed and mobile-friendliness. It’s a product from the Think With Google team, which provides insights on how to best optimize your business online to attract, convert, and retain customers. Google most prominently highlighted statistics about how websites today need to be fast.com fast, citing that if the page doesn’t load on mobile in three seconds or less, customers are likely to leave. If a site isn’t easy to use, then they are five times likely to leave as well. Which are all fair points, except Google doesn’t exactly pass its own test. According to the tool, Google’s desktop speeds could be improved by optimizing images and prioritizing visible content. Ouch. But maybe it’s just a fluke? We also tested Blogger, Google’s home for its company blog posts. The results were even worse. At least Gmail is doing okay. Jarringly enough, Think With Google, the very team that launched this product, has the worst scores by far. You know who did do a little better than Google? Maybe it’s time for a little site optimization of your own, fam. We understand you’re not the small businesses the site targets, but leading by example is a good start. Update June 3, 2016 12:45 PM ET: Google has reached out to say this has been fixed and attributes it to a potential launch day error. Whatever the reason, it appears the scores are now near perfect.